Floridays was very clean and the staff was nice and friendly. The hotel room was spacious. Great place to stay for big families. The room had all the essential including washer and dryer. No complaints about the property. The room size is great for families. But if you want a quiet vacation this is not the place. It was loud at night with people outside and if you have kids above or below you. There was a siren noise from 7 am until 11am one morning. If you are near the pool on a nice night it is loud as well. Very well maintained. It was very clean on the Floridays property. It is very roomy. Just wonderful for staying with family. And close to the theme parks. And friendly staff. This was our first stay at Floridays resort and we were very impressed. I felt it was better than advertised, our suite had hardwood floors, tile and many amenities. I really appreciated all the extra storage so that our clothing and toiletries were not left on doors and countertops. Kitchen was large with washer/dryer. Many restaurants, bars, shopping were literally in our backyard. Pool was gorgeous. We will definitely stay here again. Everything was great. Room was big. Kitchen fully loaded. Nice pools. I liked the fact that is like a aparrment and u get a washer and dryer in your room. Best hotel ive ever been to. Loved the balcony overlooking the large pond with a fountain. We had breakfast out there every morning, and enjoyed the sunset from there in the evening. Loved that there was a washer-dryer in the apartment, so we didn't take home a suitcase of dirty laundry. The front desk staff and the maintenance staff were very friendly and helpful. Very nice. Was very clean and well maintained. Loved it. This property was more then expected. Has room service available even though you get a full kitchen. Also has washer and dryer in unit which was great for us since we have a little one. They give clean towels and fold beds daily and trash removal which is definitely needed with a baby. will stay again highly recommend this place and will come back again! Orlando Vineland Premium Outlets is within a mile (2 km) of Floridays Resort Orlando, and other popular attractions like Discovery Cove are within a few miles (5 km). This 432-room, 3.5-star condo resort welcomes guests with 2 outdoor pools, a restaurant, and free in-room WiFi. Sit down for a leisurely bite to eat at the onsite restaurant, or enjoy a drink at the bar/lounge. Savor a meal from the comfort of your room with room service, or get a quick energy boost at the coffee shop/café. For your convenience, a cooked-to-order breakfast is served for a fee each morning from 7:00 AM to noon. Each condo features a kitchen and a balcony, and there's space to spread out with a living room and a dining area. Guests can expect free WiFi and 37-inch a plasma TV with a DVD player. Other standard amenities include a washer/dryer, a coffee maker, and free local calls. 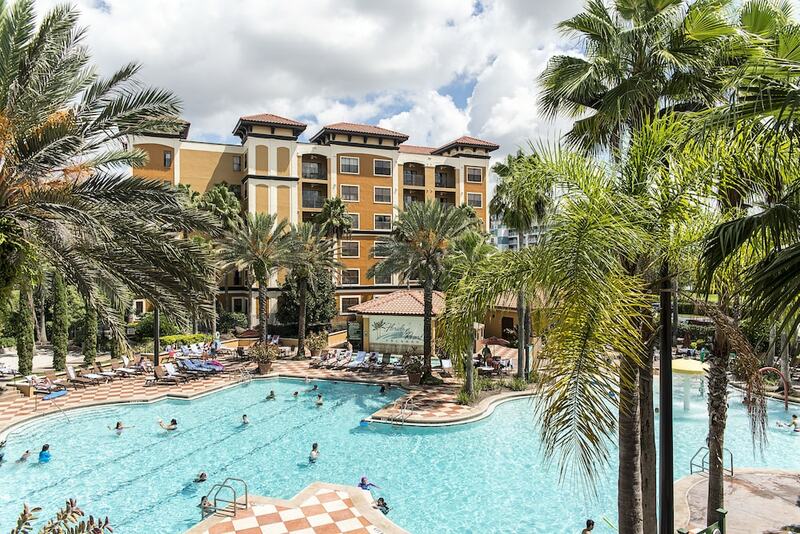 Guests staying at Floridays Resort Orlando enjoy access to 2 outdoor pools, a fitness center, and free WiFi in public areas. You can take advantage of free parking, along with a free area shuttle. Multilingual staff at the 24-hour front desk can assist with concierge services, dry cleaning/laundry, and luggage storage. Other amenities at this family-friendly condominium resort include conference space, a 24-hour business center, and a computer station. Thank you for staying with us. We hope to welcome you back with us again soon. Cooked-to-order breakfast is served daily from 7:00 AM to noon for a fee. Pool Bar and Grill - Poolside restaurant and bar serving lunch. 2 outdoor swimming pools are on site, and the condo resort also has a fitness center.